Weight: Males - 190 kg; Females - 130 kg. The lion, tawny to sandy brown in colour, is the largest of the African carnivores. Cubs are faintly spotted on the lower parts; some adults retain traces of the spots. Adult males have manes that vary in colour from tawny to black. This, together with their larger size, distinguishes them from females. Lions live a lazy lifestyle, typically active for only two to four hours in every 24. They are most active at night and rest during the day. A lion pride consists of a group of two to 12 closely related adult females with their young, attended by one to six adult males. If there is more than one male they are often, but not always, close relatives, often brothers. Only pride males have access to the pride females. 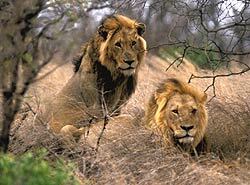 Males take over prides by driving out the current males in savage and sometimes fatal fights, and are in turn displaced by new challengers after one to 10 years. The new males expel any young males from the pride and try to kill all the cubs to bring the females quickly back into breeding condition and so ensure offspring will have their genes. After a take-over females come into heat and mate but, amazingly, do not bear cubs until the new males have established their status against possible challengers. Females give birth to litters of up to six cubs (usually one to four). Weaning starts at 10 weeks, and is completed by six months. Lions mate about four times an hour over two to three days! Pride males do not compete for available females as these females will mate with all of a pride's males in turn as each loses interest in her. Pride females suckle one another's cubs, with no bias towards their own. Lions differ from other cats by regularly hunting in groups. When hunting small prey, each lion pursues its own animal; with larger and more dangerous prey co-operation is needed to split a herd or pull down and kill one animal. Most of the hunting is done by the females. When in a pride, the males take what food they want from the females. 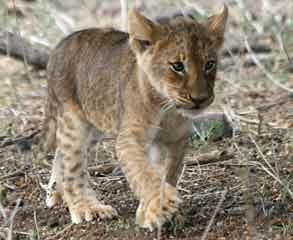 Cubs get what the adults leave, and in times of food shortage, starvation is their major cause of death. Medium and large prey, including impala, wildebeest, zebra and gemsbok. Will also take larger species such as buffalo, giraffe, hippo and young elephants. Lions will also eats birds, reptiles, fish, and even insects, also smaller mammals down to the size of mice. To hear the roar of lions at night is an experience to be savoured - provided you're safely in your tent or bungalow. Typically a lion's roar will start with a series of low grunts, building to a reverberating crescendo before trailing off again. Lions also grunt, cough and snarl. For additional information about lions, see Lion Facts and Lions Mating.